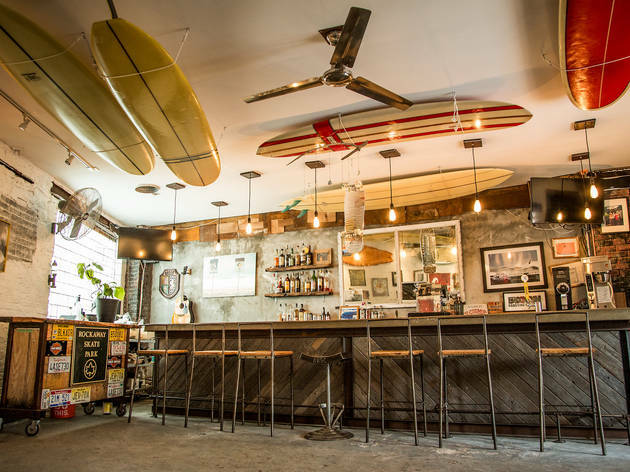 Despite the kitschy delight of eating takeaway tacos off a knee-balanced plate at Rockaway Taco, the sit-down setup at this offshoot housed inside the Rockaway Beach Surf Club is a much-welcome upgrade. Like at that OG taco shack, chef Andrew Field is fueling off-duty surfers and beach-bound locals with exemplary beer-battered fish tacos ($3.50) and watermelon juices ($4), but Tacoway boasts one major feature its forebear was missing: alcohol. Enclosed by surf board lockers, I thought the place has a pretty cool vibe. It will surely be a great hang out spot if they can utilize more space as this place can get very crowded! Btw, this place is CASH ONLY so come prepared! Best Tacos in the East! We love Tacoway Beach! The best fish tacos in NYC! I seriously went here for lunch and then back for dinner yesterday -- it is just that good! It's cash only, so come prepared (or just use the atm onsite), but tacos are reasonably priced at $3.50/ea and then they have sides and drinks for about $5. If you luck out and have a summer Friday, take advantage, because there's no line at lunch time. It is definitely jam packed on the weekend which sometimes leaves your beach lounge chair as a chair you may be tempted to open up due to limited seating. The frozen watermelon drink is delicious as are their non-alcoholic beverages like the pine drink on a hot summer day. I went over the 4th of July weekend around 5p and there was a line wrapped around the block to get in, and a taco line stretched to the far end of the outdoor patio...and yet, WORTH IT. The atmosphere is so much fun, the design is bright and eye-catching, and the tacos are seriously great. Splurge for the extra guacamole - you won't regret it. The corn is a bonus, as well. It may be out there, but I can't wait to go back! It's not summer unless you've made the trip to Rockaway Beach Surf Club for a fish taco with a side of chips and guac. What was formerly known as "Rockaway Taco" is now Tacoway Beach, which is fine with me, because I can now drink alcohol with my food. Plus there's space to sit and catch some sun. 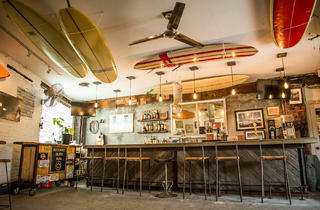 The vibe is totally surfer with a sprinkling of in-the-know hipsters and Brooklynites, like myself, who make the trip. I've had their other food/drinks, and everything is good, but it's always the fush taco I dream about. I had been hearing about Rockaway Taco for forever, and when I heard that it had closed before I got a chance to go, I nearly had a heart attack. BUT, luckily the owner opened up shop inside the Surf Club, and his taco counter is now called Tacoway Beach. I biked there, ordered fish tacos, plantain chips and watermelon juice and feasted in the spacious outside area, which has tons of benches to sit on. It was pretty empty when I went (on a Wednesday afternoon), but there is plenty of room for lots of people. Also, the fish tacos were the best I've ever had. Go to Rockaway Beach for the tacos alone.